The model number may or may not be correct. 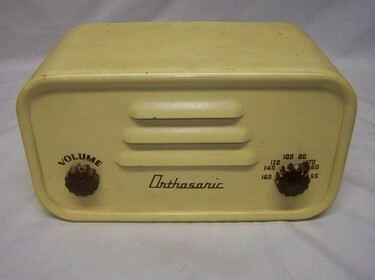 A product of the imaginatively named Electronic Laboratories Inc, this little aluminum radio looks exactly like their model 3000 as illustrated in Sams literature, but the chassis and circuit details are substantially different. The most obvious difference is the use of loktal tubes, but this set also uses a conventional diode/triode tube in the detector socket and utilizes a highly effective AVC circuit. The hank of antenna wire supplied with the set is sufficient for receiving local stations, but connection to a longwire improves its performance greatly. With about 50 feet of antenna its reception is about equivalent to an AA5.